Chauncey Starr has been a true visionary at the forefront of ground-breaking work in nuclear energy, energy production and policy, and risk analysis. 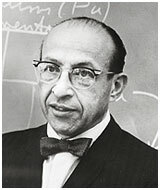 During World War II, he worked on the early development of nuclear energy. A former vice president of Rockwell International, Starr was a pioneer in the development of nuclear propulsion for rockets and ramjets, miniaturized nuclear reactors for space, and atomic power electricity plants. While dean of the UCLA School of Engineering and Applied Science, he wrote a landmark paper on how to weigh the risks and social benefits of various technologies that became the basis of modern risk analysis. He founded the Electric Power Research Institute in 1973 as an industrywide cooperative program for electricity and environmental research; he remains its president emeritus. Among his many awards and honors, Starr received the Atomic Energy Commission Award in 1974 for his work in the peaceful uses of atomic power. In 1990 President George H.W. Bush presented him with the National Medal of Technology.